Walt Sanders was a well-respected reporter for WBZ-TV where he worked 27 years. His expertise was in covering education issues (he distinguished himself during Boston’s busing crisis) and he also reporting from City Hall. 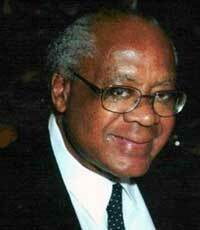 He was one of Boston’s first African-American TV reporters. Mr. Sanders was born and grew up in Akron, Ohio. He graduated with a bachelor’s degree from Baldwin-Wallace College in Berea, Ohio, and also studied at the Columbia School of Broadcasting, now based in Virginia. He started his career in radio in his hometown of Akron in 1959, and then did radio news in Philadelphia, before going into TV in Cleveland as a medical and educational reporter. After leaving WBZ, Walt participated in the Senior Olympics, and served as president of Massachusetts chapter of AARP. A jazz aficionado, he kept a substantial collection of albums at home.